In 1946, Dr. Karl and Dr. Will Menninger established a training program for psychiatrists to treat returning veterans from World War II. The former Army hospital in Topeka was the base. They assembled a faculty for the first class of 108 physicians, and the Menninger School of Psychiatry became the largest training center in the world. There was an emphasis on a didactic curriculum and a team approach to diagnosis and treatment. The model for diagnostic case study was elaborated by Dr. Karl in his "Manual for Psychiatric Case Study". In 1946, Dr. Karl and Dr. Will Menninger established a training program for psychiatrists to treat returning veterans from World War II. The former Army hospital in Topeka was the base. They assembled a faculty for the first class of 108 physicians, and the Menninger School of Psychiatry became the largest training center in the world. There was an emphasis on a didactic curriculum and a team approach to diagnosis and treatment. The model for diagnostic case study was elaborated by Dr. Karl in his "Manual for Psychiatric Case Study". Menninger School of Psychiatry, 1965, Topeka, Kansas - Dr. B. 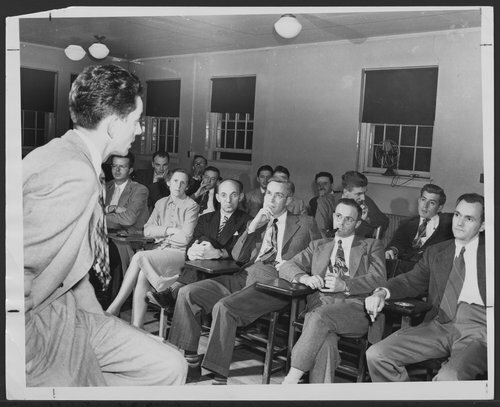 Hall is lecturing the physicians in the Menninger School of Psychiatry in the x-ray conference room at the veterans administration hospital in Topeka. They will study psychiatry for three years after their medical training.